This in-focus display celebrates the acquisition of a rare and outstanding painting. The display, acts as both a welcome and an introduction to St Luke Drawing the Virgin and Child, an exceptional 15th century painting attributed to the workshop of Dieric Bouts the Elder. This follows a scientific investigation project led by the Conservation department at the National Gallery in London. The painting is of major importance due to its connection with the artist, deemed one of the leading and most influential Netherlandish painters of his time. 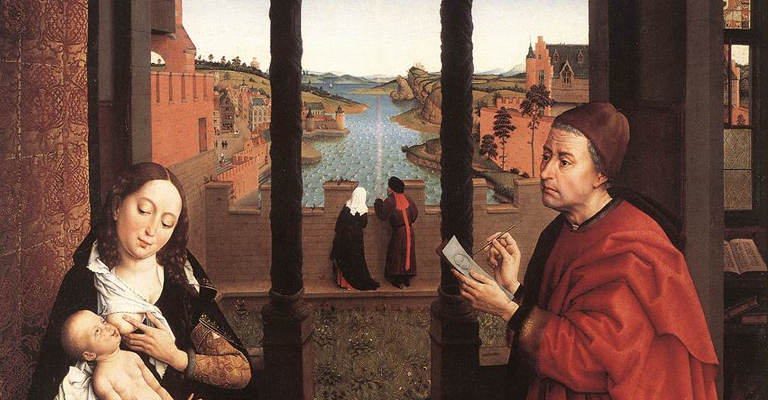 Dieric Bouts the Elder is in fact considered, together with Hans Memling, the most important follower of Rogier van der Weyden. Bouts’ works are rare in general and especially in the UK. In addition, there are no other paintings of this date and origin depicting this important subject in British public collections by Bouts or any other northern European artist of this period. Following an export bar it was acquired in July 2016 with support from Art Fund, Heritage Lottery Fund and a number of private donors, totalling £2,290,650. The Bowes Museum is embarking on an innovative partnership with York Art Gallery and Bristol Museum & Art Gallery, each with their own excellent Old Master collections, to deliver a diverse and exciting activity programme surrounding the painting which is included in the above sum. ‘Image and Substance’ focuses on the iconographic and visual relevance of the painting, offering an insight into the Netherlands’ artistic, historical, and devotional context. At the same time, it will also examine the painting’s technique and style, and will be complemented by video footage of the National Gallery’s investigations.